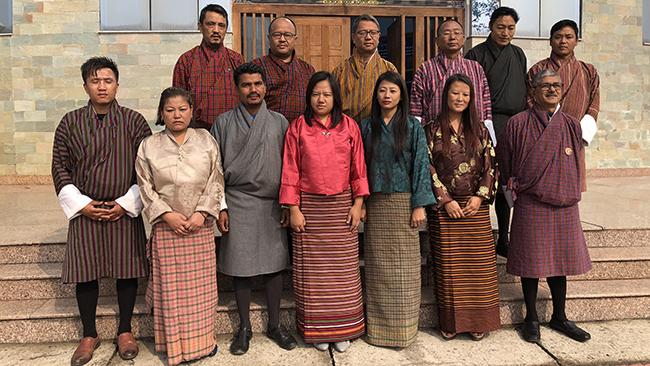 The training on Procurement and Contract Management is being held from 5th to 10th March, 2018 in Jigme Namgyel Engineering College to 10 officials from Phuentsholing Thromde under Chukha Dzongkhag. The training aims to provide comprehensive knowledge and skills on the procurement and contract management processes including the materials management to enhance the productivity and cost reduction measures. Database Management in Procurement System. The mode of delivery in training session are presentations, discussion, exercises, practical and field visits. The resource person for the training are faculty from Electrical Engineering, Civil Engineering, Materials & Procurement Management and Computer System Network Programmes.